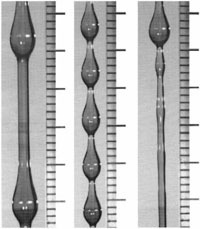 Understanding how fluids flow and interact with their environment is an extensive field of research in applied mathematics. Equally important to this understanding is the mathematical modeling of the physical phenomena and the mathematical solution method used (e.g., analytical or computational). Interfaces separate distinct phases of material. The systems can be fluid-fluid like air-water, solid-solid like alpha-beta phases of alloys, or fluid-solid. 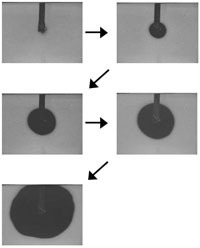 Interfaces are the site of concentrated "forces" such as surface tension or latent heat, and interfacial deflection couples with bulk diffusive processes to generate waves, convection, droplets, and many other configurations in dynamical instabilities. Many examples of interfacial phenomena and the numerical methods used to solve the models are discussed in many of the other research topic descriptions.